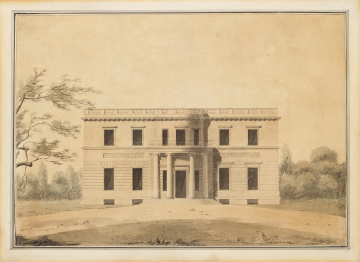 Soane office, presentation preliminary design for Tyringham House (Bucks): elevation of entrance façade. You are here: CollectionsOnline / Soane office, presentation preliminary design for Tyringham House (Bucks): elevation of entrance façade. A preliminary design showing the Ionic order rising only to the first floor and not to the entablature. There is also no attic roof above the balustrade and there are no pilasters at the corners of the building. This is one of a pair of drawings of Tyringham (with P206) that Soane hung in his Breakfast Room.